Machine can be modified for a variety of case dimensions. Please contact Contact Packaging for details. Colored lights indicate the status of the machine, blanks supply, and tape or hot melt supply. An alarm sounds to indicate the presence of a fault condition. Various communication configurations possible. Please contact Contact Packaging for details. Please contact Contact Packaging for details. The exit height of the cases can be extended in increments of 50mm up to a maximum of 850mm. Applies 75 mm (3") wide tape. Replaces standard 50mm tape head. 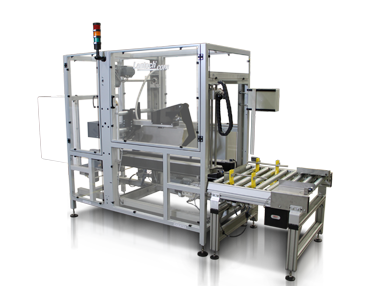 Automatic machine adjustment by random case size detection at machine infeed side or external signals. Many options available for case types and dimensions, speeds, closing methods, machine frame and magazine, and machine performance data communications are available. Please contact Customer Support if your requirements are not satisfied by the options published on this page.